After discussing with Correa the options for treating the mammary carcinoma, a hormone-driven malignancy that behaves like breast cancer in women, fourth-year veterinary student Megan Gibeley reached out to the new Clinical Trials Office at the Foster Hospital for Small Animals in Grafton. It turned out that Dutchess qualified for a trial led by surgeon John Berg that's testing a new imaging tool developed by researchers at MIT and Lumicell of Wellesley, Massachusetts. Whenever a cancer tumor is surgically removed, there's always a chance malignant cells are left behind. Even a miniscule number can provide a foothold for the cancer to recur—often within a couple of months. "The problem in both human and veterinary medicine is that we can't tell if we've gotten all microscopic bits of tumor out" during the procedure, said Berg, a professor in the Cummings School Department of Clinical Sciences. Traditionally, surgeons have had to rely on a pathologist's review of surgical samples to know whether or not they got it all, an imperfect process that can take days and may require a follow-up surgery. But the Lumicell technology has promise for allowing surgeons to check for malignant cells and remove them before the patient even leaves the operating room. Two hours before Dutchess's surgery, Berg's team injected her with an experimental drug containing a fluorescent molecule that causes malignant cells to light up when exposed to infrared light. 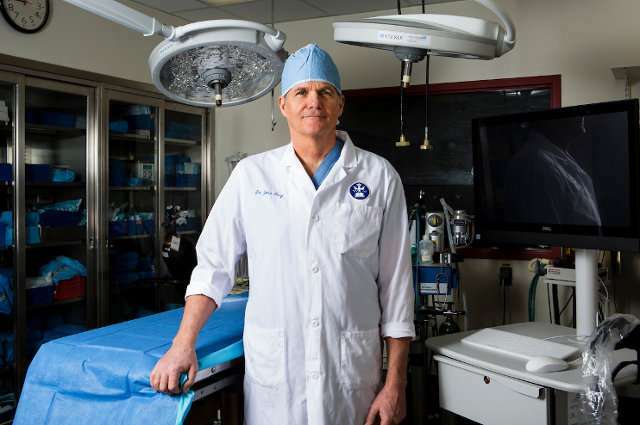 Once in the operating room, Berg removed the cancer, then used a specially designed camera to check for residual cancer within the surgical field. "If I see fluorescence, I know I may have left tumor cells behind," said Berg, noting that Dutchess appeared clear. Berg has been working with a team from Lumicell for about five years—recently including Edward Nobrega, V94, a medical affairs education specialist who helps guide veterinarians and physicians in using the technology. For his first study, Berg tested the technology in nineteen pet dogs being treated for soft tissue sarcomas and mast cell tumors. The results of that work, published in Veterinary Surgery in February 2016, found "that the technology distinguishes cancer from normal tissue with 95 percent accuracy," he said. The results helped move the imaging technology into trials in human patients, and multicenter studies in the U.S. are now evaluating the surgical tool in people undergoing treatment for breast and gastrointestinal cancers. Berg said that an important remaining step will confirm if the technology can identify even microscopic quantities of residual cancer that the surgeon would not otherwise be able to see. That question remained unanswered in the initial trial because all the tumors could be removed with very wide margins of normal tissue, meaning that there was no residual cancer at the end of the surgery. Tufts at Tech is playing a pivotal role in testing the approach in dogs with mammary carcinomas. The Foster Hospital Grafton doesn't see many cases, because its patient population is almost universally spayed early in life, and mammary cancer usually occurs largely in unspayed female dogs and dogs spayed later in life. Yet in Worcester, "Tufts at Tech has a unique population of dogs in that, due to socioeconomic or cultural reasons, often have never been spayed or neutered, or their surgery was done at a much later age," said assistant professor Gregory Wolfus, V98, director of the clinic. "When I worked in a private veterinary practice in Westborough, I might see one or two cases a year, but at Tufts at Tech we see mammary cancer every week." As those pets help Berg's study enroll enough cases to gather good data, their owners in turn reap the benefits of a clinical research program integrated with a community medicine clinic. It's providing access to the kind of cutting-edge care generally found only at teaching hospitals, and Dutchess's owner couldn't be more grateful. "I love this dog like she's my child," Correa said. "Dutchess has healed so perfectly. She's 100 percent her old self."